Summer is vibrant on Vinalhaven. There’s nice weather (even with the persistent fog), quarry dips, beach trips, lobster dinners, hard work and fundraising! 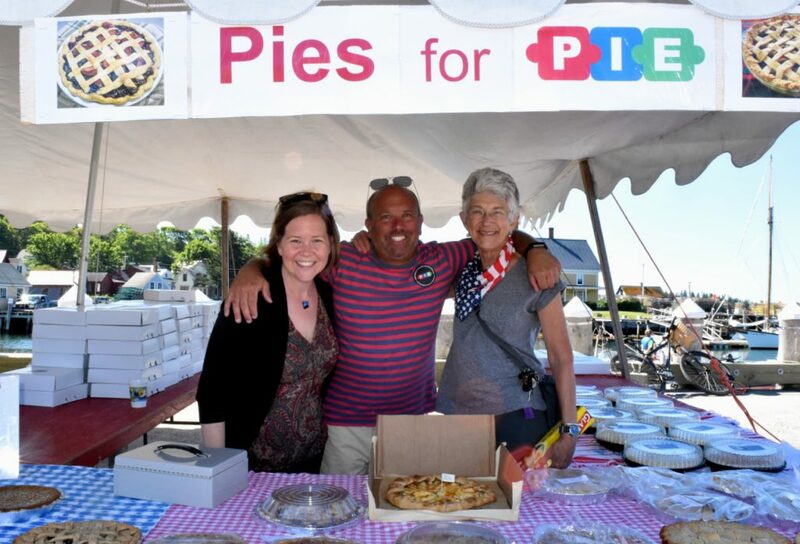 We wanted to take a moment to thank all of you who have have contributed your time, energy, and funds towards PIE at our recent events, on July 4th, and at the Saturday Flea Markets. Your support really matters and is what keeps us going, so thank you! Below are some highlights. 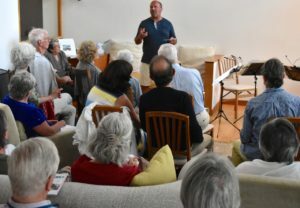 Nearly 50 people gathered at the Coombs Neck home of Susan Godfrey and Roger Hendrix to hear a mini-concert by the remarkable Cassatt String Quartet – a Manhattan-based, award-winning chamber ensemble that has been coming to the island for 15 years as part of the Seal Bay Festival. 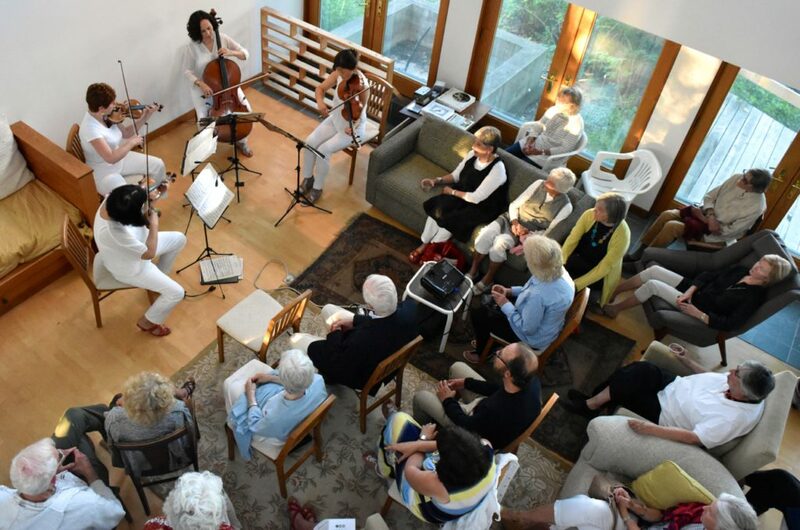 Members of the Quartet had generously offered to give a benefit performance to support PIE as a way of giving back to the community and serving the school population during their 5-day residency this July. In a space that turned out to have sublime acoustics they performed with passion and precision Borodin’s Nocturne, a movement from Ravel’s string quartet, and an original piece by island resident and composer Dan Godfrey. As PIE board member Amy MacDonald remarked, “it is always a treat to hear chamber music the way it was meant to be heard–in a chamber.” The formal part of the evening ended with a slide presentation by artist Rebecca Allen, who travels with the Quartet, on her work and the links between art, the environment, and music. Robb Warren speaks to the audience. Elementary School teacher Robb Warren also spoke eloquently about the work of PIE in the schools, finishing with a story about a visiting friend whose children attend school in Cape Cod: after hearing Robb describe some of the many things PIE does to enrich the school experience, he exclaimed, “What you have here is a private school!” The event raised $2000 for PIE. Many thanks are due the Cassatt Quartet, the Godfrey/Hendrix family, and all who supported the event. 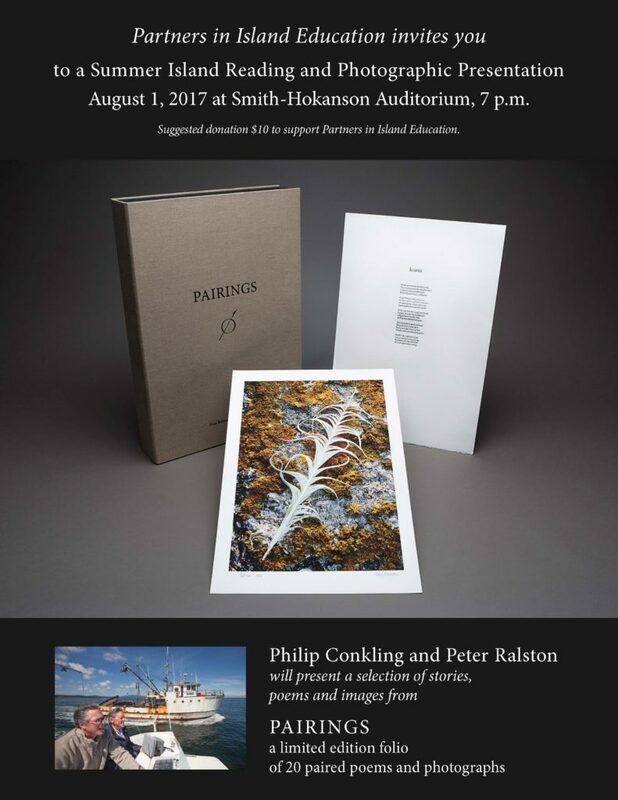 Philip Conkling and Peter Ralston will present a selection of stories, poems and images from PAIRINGS, a limited edition folio of 20 paired poems and photographs to benefit Partners in Island Education. $10 suggested donation. Donors of $75 or more are invited to attend a gala event of food and wine pairings before the 7 p.m. presentation. Donors of $250 or more will receive a limited edition print of The Lesson by Peter Ralston, paired with the poem One Room School, by Philip Conkling. This unique poem/image pairing, created to benefit PIE, is matted and suitable for framing.